On the day it became Mr. Obama’s Washington, steam still fogged the windows at Henry’s, a soul food staple not far from the White House. Go-go music still blasted from loud speakers at the corner of 7th and U. The U Street club Republic Gardens still amused overeducated members of the darker nation. After sundown, most black people still lived, played and ate and learned, due east, and most whites still lived, played, and learned due west. Same as it ever was in the nation’s capital. Cynic or not, John-Freso sat among a swirl of races at the trendy restaurant and bookstore Busboys and Poets, eyes glued to the screen as the first black president was sworn in. The at-capacity crowd screamed and shouted when Obama called for engagement with the world. They erupted in cheers when George W. Bush mounted a helicopter and left the city. There has been tension in this U Street neighborhood and in other surrounding historically black enclaves, around gentrification, or what John-Freso calls the “yuppies acting like they are doing you a favor by moving into your neighborhood.” But there has also been more unifying change brewing. The kind of change that makes millions of “white Americans, hard working Americans,” in the quiet sanctity of a voting booth where no one is watching, pull a lever for a black man. So what does it mean now that the Chocolate City has a chocolate first family? Is it possible that the invisible but ever-present walls between official Washington and D.C. will tumble down? Will the Georgetown cocktail party circuit have to darken up? Will the black communities that surround the U.S. Capitol finally believe that the shiny white dome belongs to them, too? As Obama exulted in his Nov. 4 victory speech, “change has come to Washington.” The question is: Will social and cultural integration finally come, too? D.C. has been effectively segregated since 1791 when Congress carved it from two slave-holding states, Virginia and Maryland. In The Secret City: A History of Race Relations in the Nation’s Capital, historian Constance Green described a pattern of Congress using the District of Columbia as a “political football”—a laboratory for laws that could not be passed in their home districts. Nine months before the Emancipation Proclamation freed slaves in the rest of the United States, Congress emancipated the 3,100 slaves owned by District citizens, paying the slaveholders $300 in federal tax dollars for each slave. That same year, in 1862, Congress passed a law that required public schools in the District to admit blacks. In 1866, Congress overrode President Andrew Johnson’s veto and extended the right to vote to African-American men living in the District—12 years before federal law applied to the country at large. Still, there has always been a fraught relationship between Congress and the city it ruled. Today, most of the better schools, stores and green spaces remain in the mostly white neighborhoods west of Rock Creek Park. The races still largely worship and socialize separately. In recent years there has been more mixing across the city, but black residents—no matter where in the area they live—have maintained an emotional connection to “black” spaces like U Street, a historic black strip that was an epicenter of black culture at a time when black people were unwelcome in other parts of the city. On Inauguration Day on U Street, a red, white and blue wreath lay at the foot of a monument of black soldiers who gave their lives for the Union. 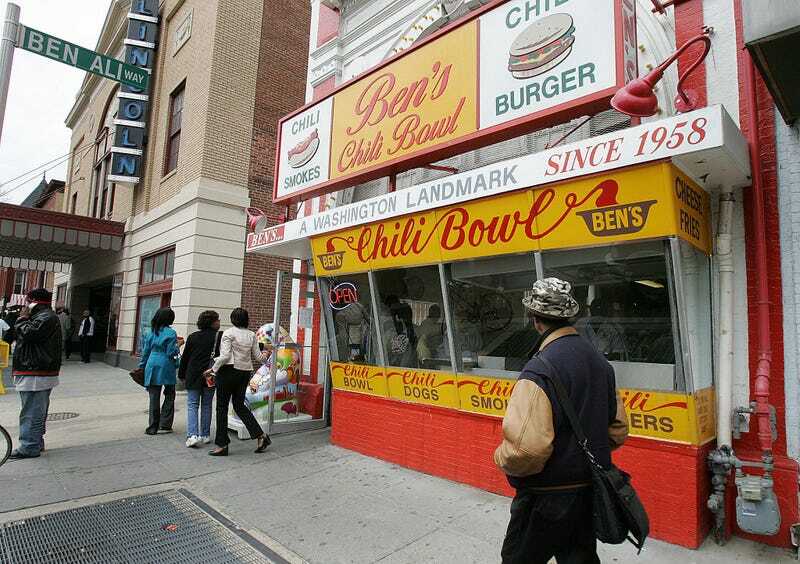 Nearby, a street peddler thrust out an Obama button to passersby, calling out “Yes you can—buy this button!” A red, white and blue Obama ice sculpture sat outside Ben’s Chili Bowl where a line stretched around the block. Standing next to a stand peddling “Obama” bottled water, a 15-year-old high school student named Ray wondered aloud what change would mean for him. His school, Thurgood Marshall Academy in Southeast Washington, is entirely black. The teaching staff is largely white. Changing that could “be better for us or worse,” Ray said. Natalie Hopkinson is associate editor of The Root.